Our 2017-18 Texas Hunting Season was again a great success with 82 Mule Deer hunters harvesting 82 Mule Deer bucks our Texas hunting leases. This is another extremely substantial harvest rate for our management and trophy hunts (48 management bucks and 34 trophy bucks between all 4 properties). Even during the worst drought in over 50 years during 2011, our managed Leoncita Ranch is on the increase for antler development due to our elevated feeding practices and management buck harvest. During our 2018 aerial survey, we observed a 1.2 buck to 2 doe ratios correlated with a 80% fawn recruitment which was a significant increase from our 2017 survey of a 55% fawn crop. While other areas in the region are experiencing a mule deer die-off, our adult numbers remain stable during the drought and with our escalated feeding program in its 13th season, our deer numbers should remain stable. We harvested 1 buck over 190 BC, 1 over 185" BC, 1 over 180", 6 bucks gross scoring over 165 BC, 10 over 160 BC and countless in the 150+ BC category. Our operation expanded in 2011 adding 2 new additional private ranches which brings our Texas landholdings for mule deer hunting in excess of 300,000 acres. These properties are some of the most prime mule deer habitat in the state without exception. All 3 private ranches have qualified for the MLDP (Managed Lands Deer Program). "We really enjoyed working with Desert Safaris and think your slogan 'come as a client, leave as a friend' is accurate!" Clients experienced a 100% success rate this season with 2018 being the best year in last five for quality mature bucks in the desert of Old Mexico. 12 hunters harvested 12 bucks scoring from 172" to 214" BC and 4 bucks taken were more than 31" wide. New development of roads, water and supplemental feeding are showing the results with dramatically increased fawn crops over the past 4 years plus substantial rainfall. Exceptional rainfall during summer of 2018 has an even brighter season on the horizon for 2019 and we expect to take some sleeper bucks on our 85,000 acres this winter. Mexico is misunderstood in the media and the state of Sonora is extremely safe and the people are as friendly and accommodating more than anyplace else on the planet. 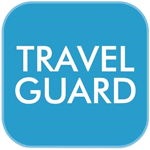 Travel is easy and secure, and we furnish all legal documentation for your hunt and entry of your firearm into the country. Coues deer, Javeliana and management. Our two premier antelope ranches in North Eastern New Mexico encompassing 107,000 acres of private land are located in Mora and Colfax counties. This particular area has produced more Boone & Crockett entries into the record book than any other location in the state with our private landholdings in the epicenter of the region. During the 2018 season on these properties, we took a limited 26 hunters between both ranches with a 100% success rate on bucks, ranging from 14 1/2" to 17 3/4". We harvested 9 bucks in excess of 85" BC and 8 more from 80" to 84". The remainder of the trophies were from 77" to 79" BC. 6 of these bucks were in excess of the magical 17" mark and the majority of other bucks taken surpassed 15". The largest buck for the 2018 season scoring a staggering 90 1/8" BC being harvested on our Mora County property. We were also featured with LL Bean Guide to the Outdoor TV show where host Bill Gorman shoots a tremendously heavy 85 4/8" buck during a dramatic stalk on video. This program will air 2nd quarter of 2018 on The Outdoor Channel. These ranches have high numbers of bucks in conjunction with the quality to go along with the densities. Both ranches have guaranteed private landowner tags so there is no application or draw trying to obtain an antelope buck permit which is an advantage on deciding who to book a hunt with this coming season. We left countless dozens of bucks that were borderline harvestable animals which should be on the high end scale for the upcoming 2019 season along with an 85% fawn recruitment this past spring. Clients experienced another 100% success rate for Axis this past season with 34 hunters, harvesting a mature buck. Our populations are strong on these free-range ranches and everyone took 30"-36" bucks and reported seeing over 20-40 different bucks per day. One client harvested a tremendous 37 1/2" buck in July that was off the charts along with 17 other clients taking bucks in excess of 33". This is one of the best free-range Axis Deer hunts to be found anywhere in Texas as our operation is one of the only in the state that facilitates this species under 100% fair chase conditions with no high fences or feeders. 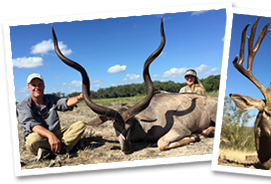 All hunting is conducted as spot and stalk- safari-style method of hunting mature trophy bucks. Our Texas Hill Country leases received ample moisture in the late fall and early winter when it's critical to new antler growth, resulting in great development already being seen. We anticipate another outstanding season for the 2019 spring/summer hunts. Many clients typically add other exotic species that we offer during this hunt and is a great time to get away and cure the off-season blues with friends and family. We kick off our hunting season annually by beginning with our sheep hunts in September and wrapping them up in April. This has become one the most popular hunts we offer. Our operation facilitated 84 Free -Range Aoudad Sheep hunts this past fall/winter with a phenomenal 90% client success rate with all clients having a 100% opportunity at mature rams. We are hunting 7 different properties (over 325,000 ac) of prime mountain habitat leased exclusively to our operation. 32 rams were harvested over 30", 4 over 34", 7 over 33" with the largest of 2015-16 season being a 37 1/2" monster harvested by Lucian Bukowski. The giant was guided by Tate McMullan and John Hamill in the Davis Mountain Range of Western Texas. Desert Safaris hosted and filmed TV shows in 2011 with Jim Shockey's Hunting Adventures, Hunt Masters with Greg Ritz and LL Bean Guide to the Outdoors hosted by Bill Gorman which aired in 2012. 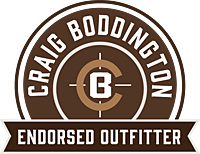 In addition, we also hosted Craig Boddington (March 2016) where he took an ancient 33" ram on video in a very dramatic sequence which has aired on the Sportsman's Channel. We added additional properties this season expanding our acreage for Aoudad, which produced some bruiser rams this fall/winter. We have been on the fast track to taking the largest Aoudad on a consistent basis in North America by surpassing any other outfitters average in the Trans-Pecos region. 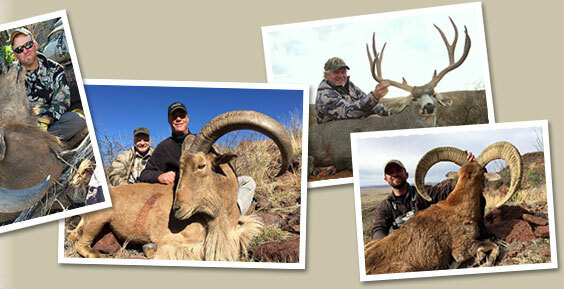 A hunt for Free Range Aoudad Sheep is noted as being one of the most underrated sheep hunts in the world and the best value in the hunting industry today. Please view or current photo gallery of Aoudad sheep as we feel our photos tell the stories of our success and reveals the quality of animals we are consistently harvesting. This species additionally qualifies for the Ovis World Slam of Sheep. Being one of the most elusive species we hunt in West Texas annually will still consistently produce 300-340" class bulls annually on our leases. Ove the past two seasons we hosted 9 bull hunts with 8 hunters harvesting bulls in excess of 300" with the largest scoring elk being 354" BC. These hunts are very limited and there is no regulated season or tags in Texas since they are on private land and non-regulated by the state. Lic for non-residents are over the counter and September -February are best months to harvest a mature bull. 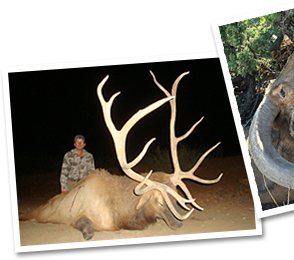 Call us to set up your next elk hunt in the Trans-Pecos region of Texas. 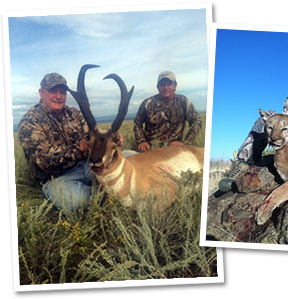 Exotics are always fun off-season hunts for our clients, we had another great year and it's not over yet. We have harvested 37 exotics this season with over 12 species represented. 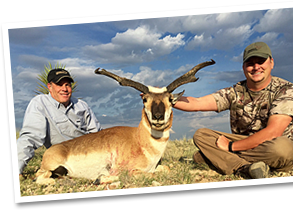 Axis Deer, Blackbuck Antelope, Addax Antelope, Scimitar Horned Oryx , Afgan-Urail Sheep, Ibex, Gemsbuck, Mouflon Sheep, Fallow Deer, Red Deer and Buffalo were just a few of the great trophies harvested this year. We look forward to seeing many repeat clients again this year for some non-stop exotic action during the off-season in 2016-17. This is a great retreat for corporate group outings or a weekend getaway with family. Please contact to inquire about any additional species hunting reports not listed here and we'll be glad to help. Thanks and looking forward to seeing you all again this season.